3.30PM UPDATE: Chris Loft leads mayor Gerard O'Connell by more than 1000 votes at the halfway mark of the race. With 33,962 votes counted Cr Loft has 33% of the vote compared to Cr O'Connell's 29%. Steve Coleman remains on 17%, Jannean Dean 10%, Greg Schmidt on 4% and Lee Carter on 2%. EARLIER: The Electoral Commission of Queensland is continuing the counting of votes across the Fraser Coast on Sunday morning. Mayoral candidate Chris Loft woke on Sunday morning with a 2% lead over incumbent mayor Gerard O'Connell who is on 30%. With about 29,000 votes counted Steve Coleman sits third at 17% ahead of Jannean Dean on 10%. Greg Schmidt has 6% and Lee Carter attracted 3%. ELECTION: Who did you vote for to become the region's mayor? This poll ended on 20 March 2016. 11.40PM: That's all from us tonight, folks, but we will be back tomorrow morning as the vote counting continues. UPDATE 11.30PM: Mayor Gerard O'Connell will get some rest as Chris Loft takes a narrow lead in the race for mayor. Cr O'Connell is sitting 2% behind Cr Loft. Gerard O'Connell on election night : Mayor Gerard O'Connell will get some rest as Chris Loft takes the lead in the mayoral race. UPDATE 11PM: It looks like we will be seeing more of Cr James Hansen - he has 90% of the vote in Division One, with half the votes counted. Bad news for his competitor Les Gallagher, who gathered just 10% of the vote. It's a tight race though in Divisions Two and Three, where the crown could still go to any candidate. In Division Three, about 50 votes separate Paul Truscott and Mark Williams. Mayoral candidate Steve Coleman remains optimistic he has a shot at becoming mayor. Mr Coleman sits in third place with 17% of the vote. Mayoral candidate Steve Coleman remains optimistic in third place: Mayoral candidate Steve Coleman remains optimistic in third place. UPDATE 10.45: Councillor Rolf Light is clear in the lead for division five by taking out the majority of votes counted so far. Cr Light has been the obvious favourite on election night with 53% of the votes in his favour. The second most popular candidate for division five has been Sue Brooks who sits at 28% followed by Bernii Allen on 18%. In a similar story, it looks as though councillor Darren Everard will too return to the Fraser Coast Regional Council team as he sits in the lead with 47% of the votes in division seven. Peter Carey is sitting behind at 22% followed by Ken Taylor at 15%, Chris Collins at 8% and Rob Braddock with 5%. UPDATE 10.15PM: CANDIDATE for mayor Chris Loft has said he would rather be 3% ahead in the vote than 3% behind. Cr Loft, who is currently the councillor for division three, spoke to the Chronicle from a subdued post-election party with volunteers from the campaign at his office in Maryborough. He said he would rather be ahead than behind. Cr Loft said it could take some time for the results to be determined but was confident with his position. He said he felt his campaign had put in the work at pre-poll to help get the results needed. About 25,000 votes were cast prior to Saturday's election day. The latest results put Cr Loft at 33.03% compared to biggest rival incumbent mayor Gerard O'Connell who is on 30.11%. Find out what Cr Loft had to say below. Mayoral candidate Chris Loft: Mayoral candidate Chris Loft said he would rather be 3% in front of the vote than 3% behind at this stage of the count. UPDATE 9:45: Chris Loft is "quietly confident" about the election results, with a slim lead over Gerard O'Connell. But it seems unlikely this election will be over in a hurry. "The results are nudging a bit my way," Mr Loft said. "The community has spoken -- last time I got in by two votes, after three recounts, and that took three weeks." Gerard O'Connell did admit to a few worries, but said he was remaining optimistic. "I've tried to run a very positive and progressive campaign," he said. "I'll look to a bit of rest tonight and see how the next day pans out." UPDATE 9:15: Chris Loft has pushed forward with 33% of the 23,129 votes counted so far in favour of him becoming the Fraser Coast's next mayor. Despite an earlier lead, incumbent mayor Gerard O'Connell is at 30%. Trailing behind is Steve Coleman on 17%, followed by Jannean Dean on 10%, Greg Schmidt on 6% and Lee Carter on 2%. UPDATE 8.40PM: Incumbent Division 4 councillor Daniel Sanderson holds a commanding lead with 29.22% counted. Sanderson has garnered 46.04% of the vote, with Darryl Gleich his closest rival (22.7%). Jamie Hoolahan (15.05%), Robert Tralau (10.72%) and Perry Ward (5.49%) are well behind. In Division 3, the seat vacated by mayoral candidate Chris Loft, Paul Truscott and Mark Williams are well ahead of their competition. With 29.15% of the roll counted, Truscott leads Williams by 132 votes (44.34% v 37.39%), ahead of Gary Gilbert (11.8%) and Michael Tudman (6.48%). UPDATE 8PM: The two incumbent councillors are trading blows with Chris Loft at 31% and Gerard O'Connell at 31%. About 13,224 votes had been counted. Cr O'Connell said he would keep his "fingers crossed". "It looks a bit tight - I don't think there are too many preferences," he said. "I'm hopeful, I always believed it would be tight." At his campaign party at Susan River Cr O'Connell said he had expected to perform better in the Bay divisions. "It became obvious in the last weeks and months people in those divisions showed a greater positivity and a greater endorsement in my plan," he said. UPDATE 7.50PM: With almost 10,000 votes counted Gerard O'Connell holds his narrow lead with 34% of the vote compared to Chris Loft's 30%. Steve Coleman remains on 17% ahead of Jannean Dean on 11%, Greg Schmidt on 5% and Lee Carter on 3%. A total of 9887 votes have been counted. UPDATE: 7.30PM: Gerard O'Connell has surged back into the lead as Hervey Bay divisions begin to be counted. With 7065 votes counted Cr O'Connell has 34% of the vote ahead of Chris Loft at 27%. Steve Coleman has 17% and he leads Jannean Dean on 12%. Greg Schmidt has 4% and Lee Carter has 3%. The Hervey Bay booths are expected to favour Cr O'Connell. UPDATE 7.10PM: James Hansen has a whopping 90% of the early vote for Division 1, with nearly 300 votes counted. His only competitor Les Gallagher trails with 10%. In Division 2, former LNP Member for Maryborough Anne Maddern is showing an early lead with 42% of the vote, but incumbent Phil Truscott is not far behind at almost 38%. Gordon Dale is in third place with 16% and Michael Weekes trails with 3%. But the division could still go to any contender, with only 115 votes counted. UPDATE 7PM: Chris Loft is leading Gerard O'Connell as the first results are counted. With 448 votes counted Cr Loft has 35% of the vote compared to Cr O'Connell on 21%. Steve Coleman is third on 19% while Jannean Dean has 11%. Greg Schmidt has 10% and Lee Carter with 2%. The results come from booths in division one, two and seven. RESULTS: The first results are in for the Fraser Coast Regional Council mayoral candidates showing Chris Loft in the lead and incumbent Gerard O'Connell close behind. More to come. UPDATE 6PM: Polls have now closed in the Fraser Coast Regional Council election. Results will be posted as they come to hand. In the meantime, who did you vote for to be the next mayor. UPDATE 5.15PM: Mayoral candidate and division three councillor Chris Loft said he is feeling "good and well" about an hour before polls close. "Looking forward to having a result tonight," he said. "A lot more people have made up their minds as they go to the polls." Check back from 6pm for election results. Chronicle journalists will also be tweeting from 6pm using the #fcvotes16 hashtag. UPDATE 4PM: Polling booths close across the region close in a little more than two hours. Mayoral candidate Greg Schmidt cast his vote at Tinana State School just after lunch. He told the Chronicle he was feeling confident about his chances in Maryborough but was not sure how he had gone in Hervey Bay. Take a look at what he said here. Mayoral candidate Greg Schmidt: Mayoral candidate Greg Schmidt said he is confident about his chances in Maryborough but is unsure how he has gone in Hervey Bay. Also at Tinana, candidate for division two Michael Weekes through is backing behind mayoral candidate Jannean Dean. UPDATE 1PM: Betting has been suspended on the market for the next Fraser Coast mayor. Sportsbet.com.au had halted betting on Saturday afternoon. Throughout the election incumbent mayor Gerard O'Connell remained the bookies' favourite at $1.90 while councillor Chris Loft sat at $2.50. UPDATE 12.30PM: Two candidates have refused to be drawn and say who they have voted for for mayor. Incumbent councillor for division one James Hansen and candidate for division three Paul Truscott did not say which of the six candidates got their vote. Cr Hansen said he voted no in the referendum while Mr Truscott urged people to remember the state does not have an upper house. Follow all the action from all the divisions on twitter with #fcvotes16. UPDATE 12PM: Incumbent mayor Gerard O'Connell has voted at Sunbury State School this morning. Before voting Cr O'Connell spoke to volunteers. He told the Chronicle he was feeling quietly confident ahead of the result. Cr O'Connell said the attitude in the community was positive. Check out what he said in the video here. Incumbent mayor Gerard O'Connell feeling confident: Incumbent mayor Gerard O'Connell told the Chronicle he was feeling confident and positive after casting his vote at Sunbury State School on Saturday morning. Chris Loft and Lee Carter have already voted at pre-polling booths earlier in the week. Greg Schmidt is expected to vote in Tinana later in the day. 11.40AM: Voters at Sunbury State School and St Paul's Anglican Church in Maryborough appeared divided on who would make the best mayor. Three names kept coming up with the most frequency though - incumbent Mayor Gerard O'Connell, division three councillor Chris Loft and businessman Steven Coleman. Here is what the voting looked like at St Paul's. St Paul's Maryborough Polling Booth: Maryborough residents took to the polls on Saturday to have their say about who should be mayor. 9AM: Election day is already a scorcher in Maryborough - it's 29 degrees and set to reach 33 degrees by noon. There was a small queue at the St Paul's hall about 8.15am as people tried to beat the heat, but since then, there has been no wait for voters. Volunteers at the St Paul's polling booth believe the reduced crowds may be due to the large number of people who have already cast their votes. An estimated 25,000 people are believed to have pre-polled in the past two weeks - about 5000 pre-poll votes than at the last election. 8AM: The polls have opened at polling places right across the Fraser Coast as the region decides its future. Six candidates are standing for mayor in the region. WATCH: Has your vote been swayed throughout the local government election campaign? : Has your vote been swayed throughout the local government election campaign? 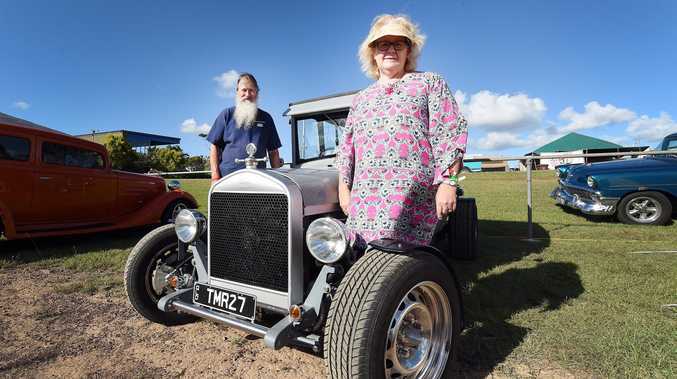 Fraser Coast Chronicle / Hannah Baker. To find out more about the six candidates, click here. REFERENDUM: Is Fraser Coast in favour of four-year terms?